Thread: sliding drop outs and lock washers or not? Just wanted to ask how many of you saw the need to add some sort of locking washer under the bolt heads on your sliding drop outs. I haven't personally but have wondered if they are something that may have a tendancy to work loose over time or not. You'll be fine. Have two bikes with sliders and no issues albeit they need to be tight! I have never used lock washers. I put a single drop of each blue threadlocker on each bolt though. I would do that except I am running 2 cogs and I switch from one to the other depending on my ride so I need to be able to move my sliders when needed. No need for loctite. The bolts themselves should not be coming loose if properly tightened. These type of sliders are very problem free. Enjoy. I haven't had any issues with them coming loose.......yet. That's why I asked cause I wasn't sure if it would happen someday and catch me off guard lol. I use a torque wrench for every place where more than one bolt is sharing a load, for example on the 4 bolts that holds the bar to the stem, the 2 bolts that hold the stem to the fork and so on and also on the two bolts on each side holding my sliding dropout in place. It doesn't really matter how much torque as long as you don't overdo it and as long as all the bolts working together gets the same torque. I've got one of these https://www.louis.eu/artikel/prof-mi...?list=44647840 which has a 3-15 Nm range that works very well for a bike. You could just tighten the bolts by feel, I do that with single bolts, for example the bolt holding my brake grip and so on, but when multiple bolts are involved you'll end up with the one tightened the most doing all the work while the others tends to work themselves lose over time. Use a torque wrench and the all share the load evenly and stay nice and tight. Good advice. I was just telling a friend of mine today, as he was re ringing his golf cart motor , that equal torque was really more important than the exact torque value. getting damaged from repeated tightening and loosening of the bolts. 24 to 26 Nm is quite a lot, I've been tightening the bolts holding the sliding dropout on my Kona Unit at 11-13 Nm and they never moved. 1) I loosen the bolts and the adjuster screws on both sides. 2) I tighten the adjuster screw on the drive side until the chain is nice and tight, then dial it back a little to give a bit of slack in the chain. 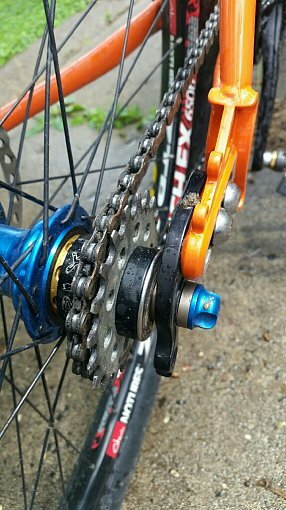 3) I tighten the adjuster screw on the non-drive side until the wheel is nice and centered between the chain stays near the bottom bracket. 4) I set my torque wrench somewhere between 11 and 13 Nm, doesn't really matter if it's 11.2 or 12.6, just in the 11-13 ball park. 5) I tighten all 4 bolts holding the sliding dropouts at the same torque. 6) I check that the wheel is still nice and centered. 7) I lock the adjuster screws with the nut. 24-26 Nm seems quite excessive, never had any issues with using half that. i reef on the slider bolts as hard as i can and have never had any issues. at all. ^Sound advice IMO, they may work without them but washers (not split lock washers) make everything better. When I switch to my 18 tooth smaller cog, I do not bother to screw my adjuster bolts in to compensate for the slider moving rearward. I leave them locked down and just pull the tire back centered by hand and tighten the slider bolts down. Then when I move back to the 20 tooth cog, the sliders fall right back against the adjuster bolts where I have them set at. sounds like a lot of work...............for a "singlespeed"
I swapped out the button head cap screws (5mm hex) for socket head cap screws (6mm) hex. 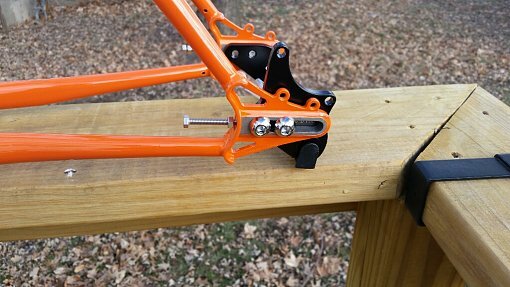 No rounding problems and cheaper than the Paragon Ti bolt option. I also use lock washers as extra insurance. LOL! The only reason I did that is so I can use the 18 tooth cog when I ride urban stuff and also to get my legs stronger. When I go off road (which it has been too long) I use the 20 tooth.